On October 3rd, the German government is celebrating the fall of the Berlin wall with the motto “overcoming borders”. At the same time Europe is building multiple higher fences to block its external borders to hinder refugees who are fleeing war, persecution and life threatening circumstances. Being far away from home with hope for a better future costs ten thousands of people their lives or losing their beloved ones due to the fact that they are missing safe and legal escape routes to Europe. People are fleeing for various reasons. They are fleeing war, violence, environmental destruction, discrimination and economic deprivation. Many of the escape reasons are based on the destruction of their basis of existence through the EU and its economic interests which are represented through European cooperation. Bremen and its armaments industries are also strongly profiting from this. Nazis. Fears of the population are often being taken out on refugees and are then expressed by racist discrimination and violence. FIGHT RACISM AND NAZI TERROR! On the outside, Angela Merkel proclaims a welcoming culture. She and the German government are planning further massive intensifications of the Asylum laws: ten thousands of people are fearing the exclusion from basic human rights including social security, welfare and medical care. The government plans to expand imprisonment, deportation and to declare more countries as safe. These differentiations between allegedly “right” and “wrong” reasons for fleeing are feeding the conflict even more which divides the refugees into imaginary groups: “Good refugees” are well-educated professionals for whom the economy can make exceptions when it comes to minimum wage. “Bad refugees” are for instance the Roma from Balkan countries who are systematically discriminated and persecuted. We are fighting against the categorizing human beings. STOP RACIST ASLYUM RIGHTS, SAME RIGHTS FOR EVERYONE! 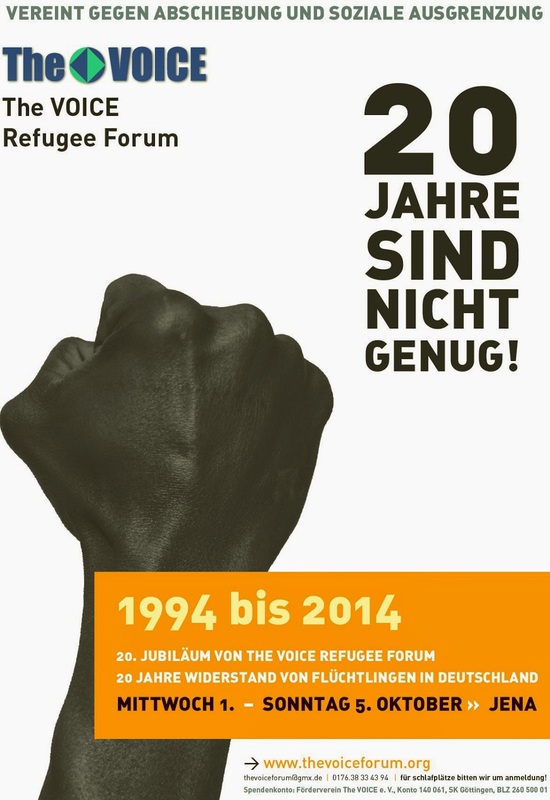 The political authorities in Bremen force refugees to live in overcrowded camps, gyms, tents, therefore creating unreasonable living circumstances. The Senat of Bremen even declared living in tents as suitable for winter – despite the fact that there is enough living space within the city. The situation of unattended and underage refugees has gotten worse during the last few months. Many of them are declared adults by Bremen authorities, in order to withdraw them from youth services, redistribution and increase deportation. Standards of youth support and the fundamental right of education are not valid for everyone in the same way. STOP UNREASONABLE CIRCUMSTANCES, HUMANE LIVING CONDITIONS FOR EVERYONE! 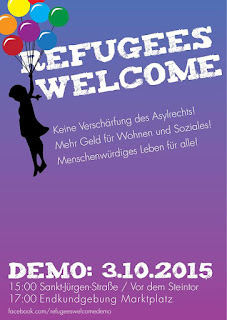 - NO MASS ACCOMODATIONS OF REFUGEES IN TENTS AND GYMS! - AFFORDABLE LIVING THROUGH IMMEDIATE SOCIAL HOUSING! - DAYCARE AND SCHOOLING FOR EVERYONE – MORE TEACHERS, EDUCATORS AND SOCIAL WORKERS! - STOP ILLEGAL DETERMINATIONS OF AGE FOR UNATTENDED MINOR REFUGEES! 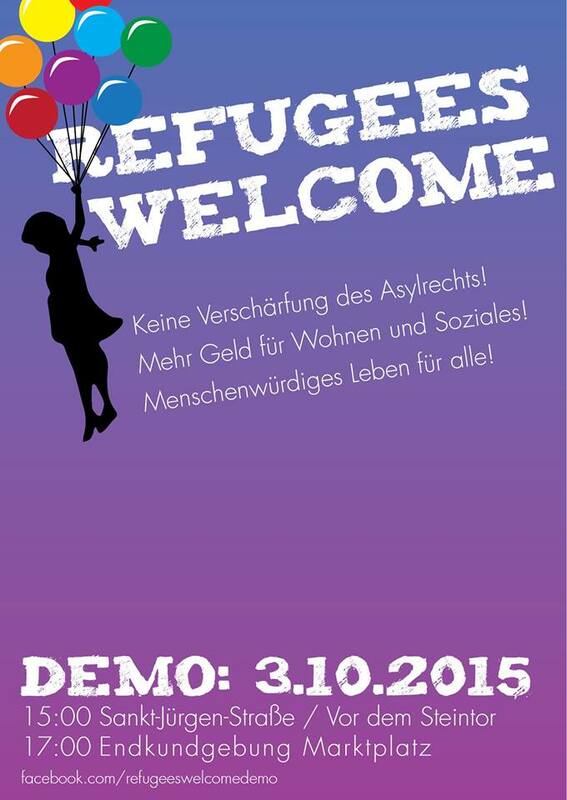 - PROTECTION FOR PEOPLE IN DISTRESS – STOP THE INTENSIFICATION OF ASYLUM LAWS! - NO WALLS AROUND EUROPE! - CREATE SAFE ESCAPE ROUTES, FIGHT ESCAPE REASONS! Together we fight for our rights! Let’s fight all together against racism and for creating a good life for everyone! We stand for an open Europe and for one world where no one has to flee.